Press handstands are one of the coolest gymnastics/acrobatic skills out there (clearly a personal opinion). They are a demonstration of control, strength and body awareness that can be done virtually anywhere. I've been told that running is cheap fitness - true! And now I submit that handstand training be considered as a the strength/balance training version. Over the next several blog posts I am going to outline the handstand. Where to start if you're a true beginner, what muscles are working at each point in the skill and how to assess yourself and progress yourself within your strength/ability level. Even if you're not at that level yet - say that you're still kicking up or jumping up to the handstand, no worries! The exercises outlined in this post will still help you - you just have more ground to cover. Most people that have been training handstands actually have the strength to do a straddle press - what they lack is the flexibility. When you're trying to straddle press, the goal is to keep the legs/toes as close to your torso (center of mass) as you can. Think wide straddle, flat pancake stretch as the legs rise (they should travel in the frontal plane along your sides - not your front). So - if you don't have a great straddle OR you don't have a full pancake, you are actually using TOO MUCH MUSCLE when attempting the press (and making it much, much harder on yourself). 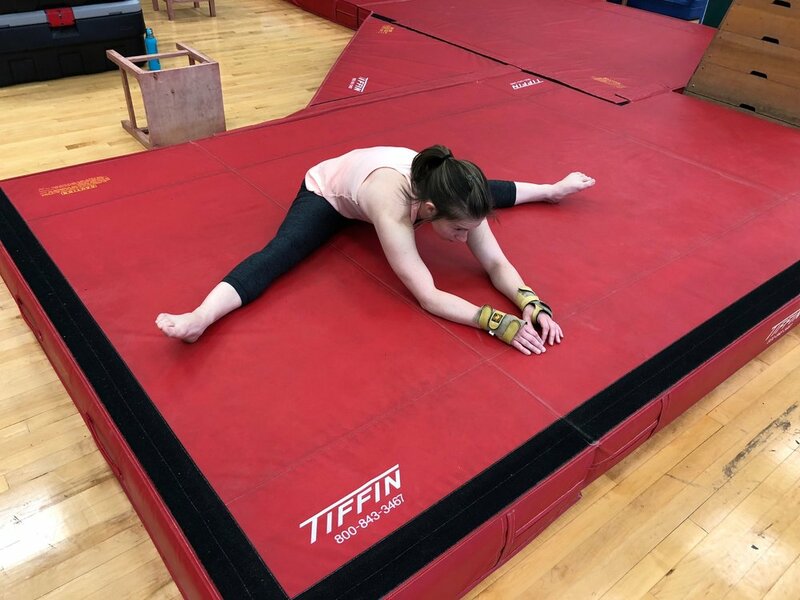 I could talk about all the structures involved in this skill (the muscles, joints, connective tissue, nerves....) - but I'll save that for a later post. For now, just focus on stretching. Keep the legs straight and the back straight. Bend forward from the waist and press your lower torso to the floor between your legs. Keep the quads engaged, the core engaged and the head neutral (peeking through your eyelids at your hands). Dosage: 1-2 times a day; Hold for 30-45 seconds. Do 4 repetitions. When you're doing a press from a straddle L-seat, your illiopsoas (hip flexor) and quad (specifically the rectus femoris) are two of the main leg movers. They pair with the lower abdominals to stabilize the pelvis/low back, initiate the lift of the legs and begin the press roll-up in the hips. The problem is, when in a straddle L-seat, they are in a shortened (aka weak) position. The solution - train them in this position! Sitting in a straddle, place your hands flat on the ground in front of you (ideally between your knees or just beyond). With the back flat and core engaged (think belly button to back), press through the hands and lift your legs off the floor. Be sure to keep the legs straight and the toes pointed. Try for 5-10 repetitions (it'll likely cramp in your thighs because the muscles are in a shortened position). Do 2-3 sets. Try for 3-4 non-consecutive days per week in your training. It's no surprise that a strong shoulder girdle and core are an essential part of a handstand. There are dozens and dozens of ways to train these areas, so feel free to branch out and do your own thing. That said, if a standard elbow plank is not part of your routine - you're missing out! Hold the body straight with the shoulder blades neutral (not too far back, not too far forward and definitely not by your ears). Engage the core by pulling the belly button to your back and keep the head neutral. Hold for 30-60 seconds (stop when your form breaks) & do 3-4 repetitions. The abs are a postural muscle, so you can work them 5-6 days a week without risk of injury. This is basically the skill shown in the first video above. Pick a surface (floor, chair, paralletes, handstand blocks, canes, etc). Force yourself to NOT jump into the handstand. Instead, simply press as high as you can, and then lower to a straddle L-seat SLOWLY. If you make it to the handstand, GREAT! If not, that's ok too - just focus on the slow descent. This eccentric exercise will help develop your strength, balance and the motor programs required to reverse it and press up (in time). Do 5-10 attempts (stop when your form breaks). DO this 3-4 days a week (ideally non-consecutive days).